VANCE & Hines' 2012 range of exhaust systems includes the Big Shots Long, a 2-into-2 system created for use on Softails. 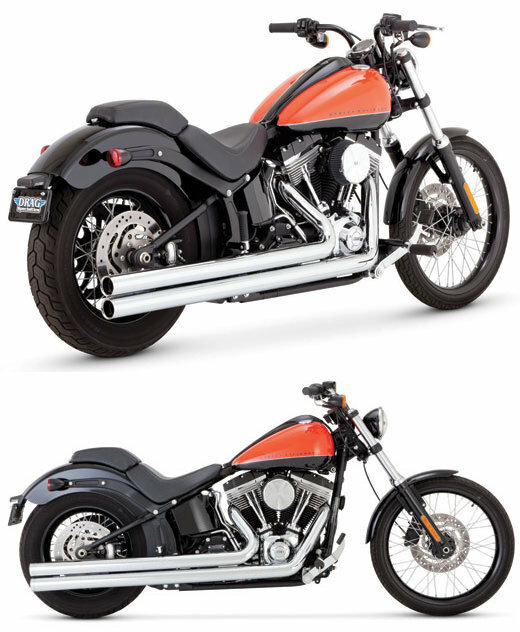 The company describes the pipes as having 'a nostalgic look especially suited for the Heritage Softail Classic, where the length of the exhaust system runs beneath the saddlebag to the edge of the rear wheel'. Features on the pipes include the Vance & Hines 'Power Chamber' hidden crossover, one-piece full length heat shields and straight-cut CNC machined end caps. The pipes are supplied as standard with louvered-core baffles, and can also be fitted with optional quiet baffles. Finished in chrome, the pipes also use Vance & Hines' new flat plane mounting panel for 12mm oxygen sensors, which are said to position the sensor deeper into the exhaust stream, providing enhanced data feedback to the ECM.